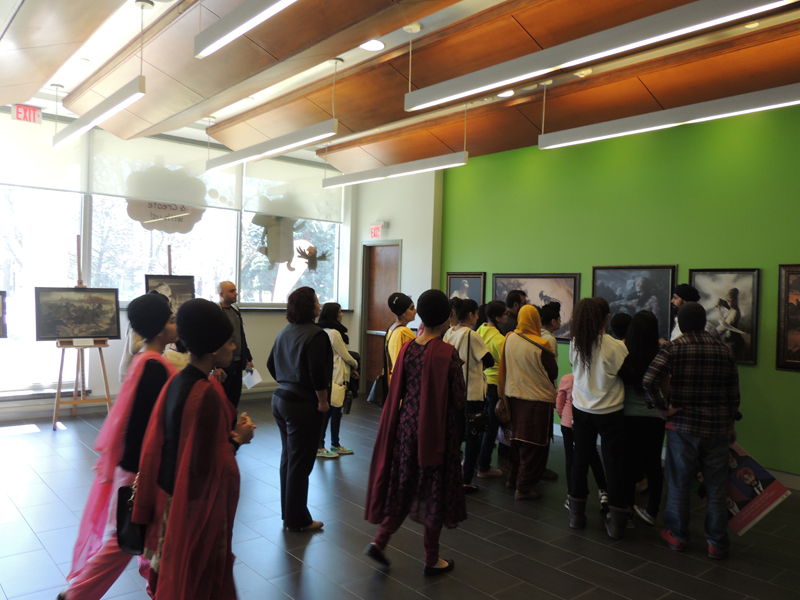 The Sikh Heritage Month is going on right now, in Brampton. 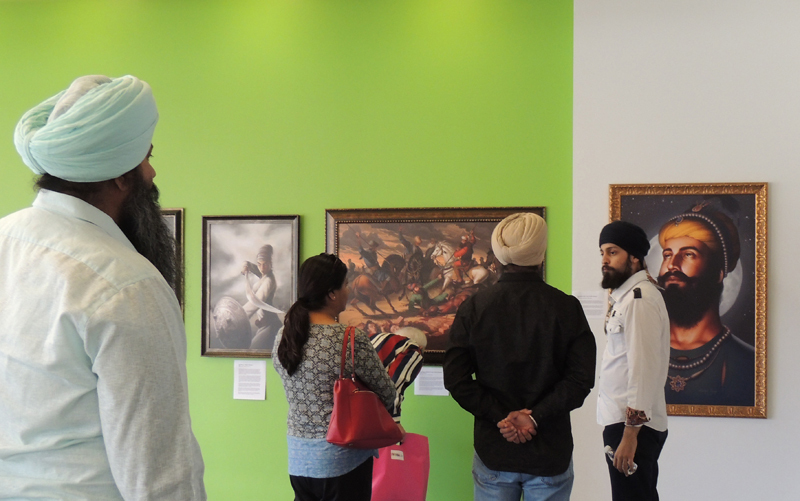 For the full month of April, the organizers arranged for a magnificent exhibition in the Peel Art Gallery, Museum and Archives, showing the work of local Sikh artists and of those living abroad. Last weekend on April 16, they gave me the opportunity to display my artwork, and have a solo show – Sikhi Art by Bhagat Singh – displaying all my paintings in one place, in one room. 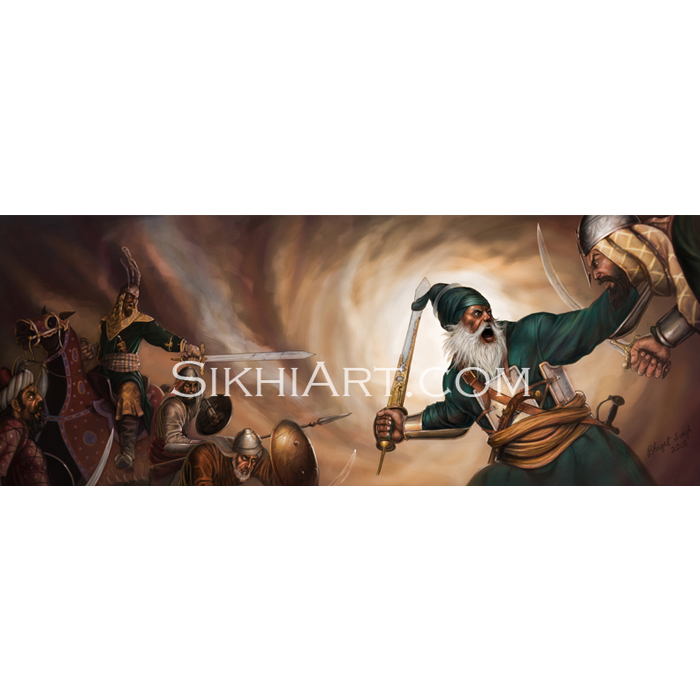 The central theme of my show was about the qualities embedded in our multi-faceted Sikh History, which is a history of warriors and saints. I dive deep into this blood-filled history and I meditate on Ram Nam so that my artwork embodies and emphasizes both of these qualities of Vir Ras and Sant Ras, Warrior Essence and Saint Essence. In the exhibit, I had a series of paintings showing the events that happened in the 1700s starting from the Battle of Anandpur to Battle of Chamkaur to Machhiwara to Battle of Muktsar to Battle of Sirhind. I felt that these would help the viewer develop a clear picture of our history in their minds. Previously they may seen these images separately and may not have understood the connection between them. But when you place them all in order, now the connection is understood. The first painting is of Bhai Kanhaiya ji feeding water to fallen Mughals soldiers in the Battle of Anandpur. 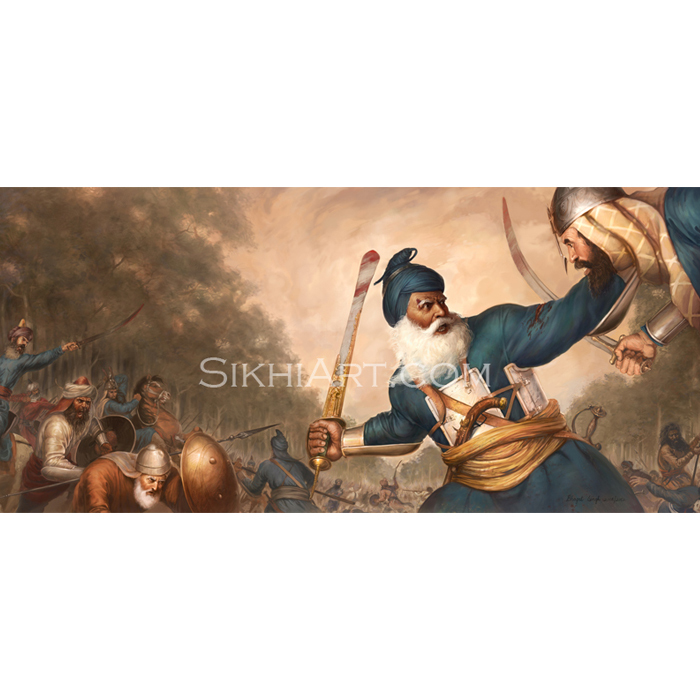 This connects to the painting of the sacrifice of Sahibzada Ajit Singh ji in the Battle of Chamkaur, that took place after Singhs left the under-siege Anandpur. 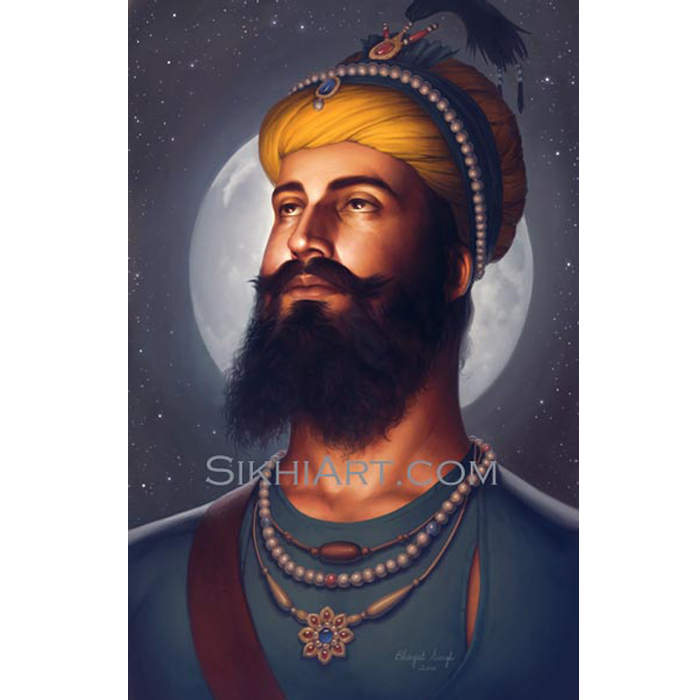 This connects to the painting of Guru Gobind Singh ji in Machhiwara, where he meditates after Battle of Chamkaur, after losing all his devotees and sons, the Vadde and Chotte Sahibzadey. This connects to painting of Mother Bhago ji in the Battle of Muktsar, where she compels the 40 Singhs, who had previously deserted Guru Sahib in the Battle of Anandpur, to return back to Guru Sahib. There the battle of Muktsar took place and the 40 Singhs became martyrs. And lastly, these events connect to the Battle of Sirhind, where Banda Singh Bahadur ji’s army captured Wazir Khan for executing the Chotte Sahibzadey, who were innocent. These connections that take a long while to describe with words can be made very easily with art. Furthermore, these connections can be made not just by placing paintings together and getting the larger picture develop in your mind, but also by depicting separate events together in one painting like my painting of Banda Singh ji Bahadur Avenging the Chotte Sahibzadey. This painting depicts the martyrdom of Chotte Sahibzadey and the capturing of Wazir Khan in one painting. These are events which are separated by several years however in the painting the viewer can see how they tie together. Art makes you see things you have never seen before. Art makes you develop connections in your mind that were previously dormant or were never present. 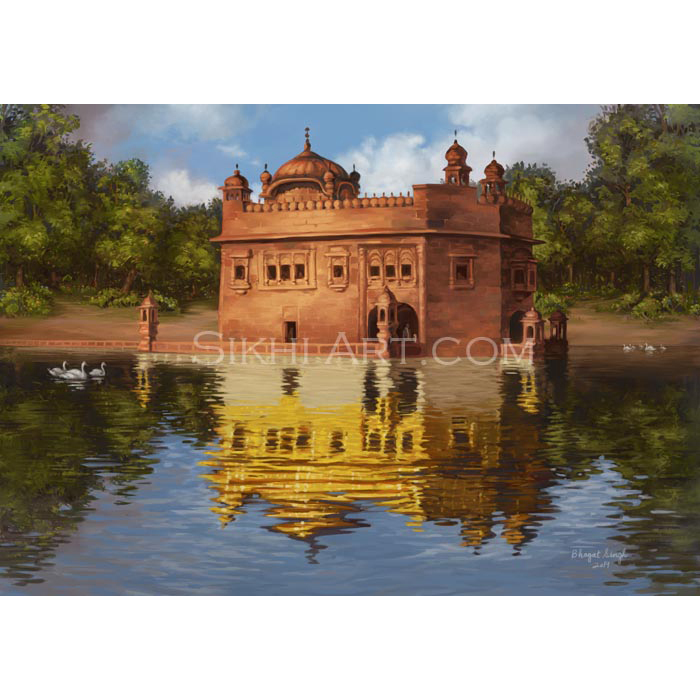 Art makes you see the larger picture of reality, for example the larger painting of Sikh History, at a quick glance. 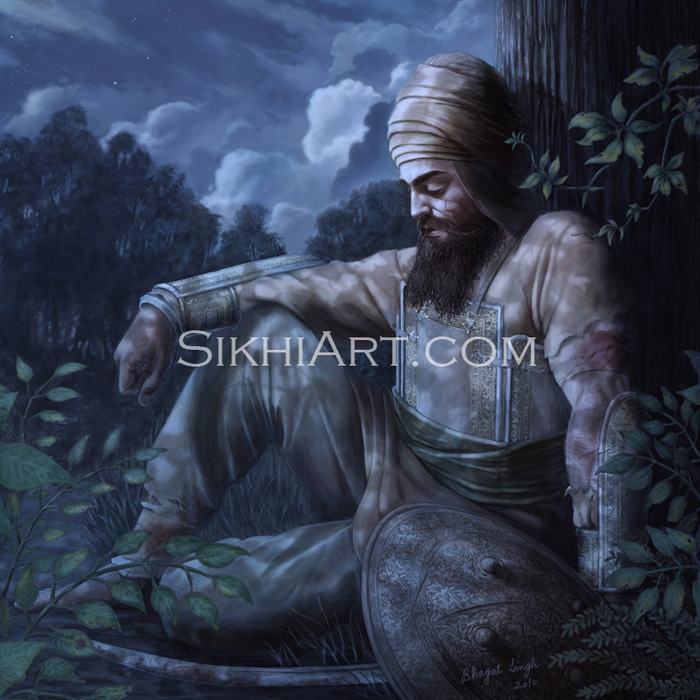 After seeing my painting of Guru Arjun Dev ji’s martyrdom, a man in his senior years told me that he felt the presence of Guru Sahib right there and then. He wiped away his tears and sat down with me to have a chat. He told me exactly what he felt and was curious to know who I was and what I did. This is the power of art. This is the power of art that the Wahe Guru himself has given to the language of art. Art can vibrate at the frequency of Waheguru, and so art can fill people with his essence in an instant if they are receptive to it. This is why kids benefit from exhibitions the most because they are just growing up and need to be exposed to Sikh history at an early age to imprint upon them the ideals of the Gurus and other Sikh legends. Our kids and youth are the future generation of our people and they will carry these imprints with them and shape the world in which they live. In Guru Granth Sahib, Guru Sahibs paint images of God, his stories, his activities, his saints, their stories and their activities. Guru Sahibs paint these through their words to stimulate us visually. They ask us to listen to this bani, so that we maybe be inspired through listening. They ask us to recite and meditate on bani, so that we get into the rhythm of bani through the activity. All of these add up to create a stronger experience of Bani. So I believe that the more ways we can teach our children, the better. Through visuals and paintings, through sounds, through touch and activity, etc. All of these add up to create a stronger learning experience for them. Paintings in your home are great tools for teaching children because children tend to be very visually-oriented and very curious. 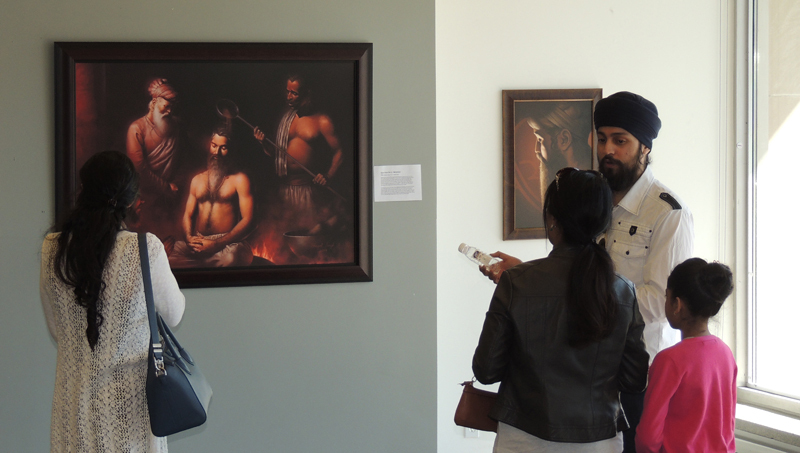 So a Sikh history painting sparks their curiosity and immediately gets them interested in Sikh history. They may not understand every word you speak. But they can grasp the main point of the painting and develop an image of it in their mind. This is how I got into studying Sikh History myself. When I was young, I was exposed to the depictions of our history by the influential Artist Kirpal Singh ji. It was only after I saw his work that I was inspired to learn more, and find out what the paintings were about. Later on in life, I would sit down and paint some of those very stories I learned about when I was 11 years old. Lastly, everyone had the chance to learn about other faiths, other religious traditions. In Shaiv Philosophy, the image of Shiv ji is used as a metaphor to describe God. Right beside my painting of Shiv ji, I included a brief description that explained what Shiv ji is all about and the deeper spiritual message that his image represents. This is not to say we are the same religion as them, rather this to inspire an attitude of learning about other religions. 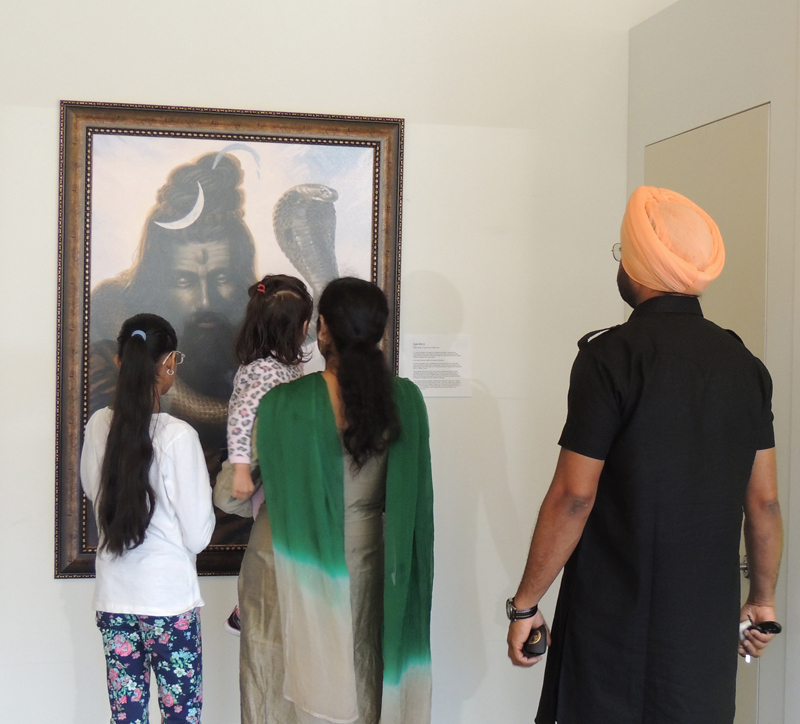 Members of the Shaiv Religions, those who worship Shiv ji or Ganesh ji, also came to view the exhibit and were inspired by the Sikh History paintings on display. 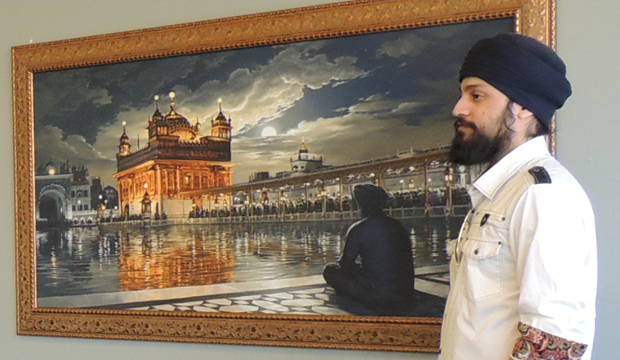 They spoke with me about this painting of Shiv ji as well as the paintings of Sikh Warriors and Saints. 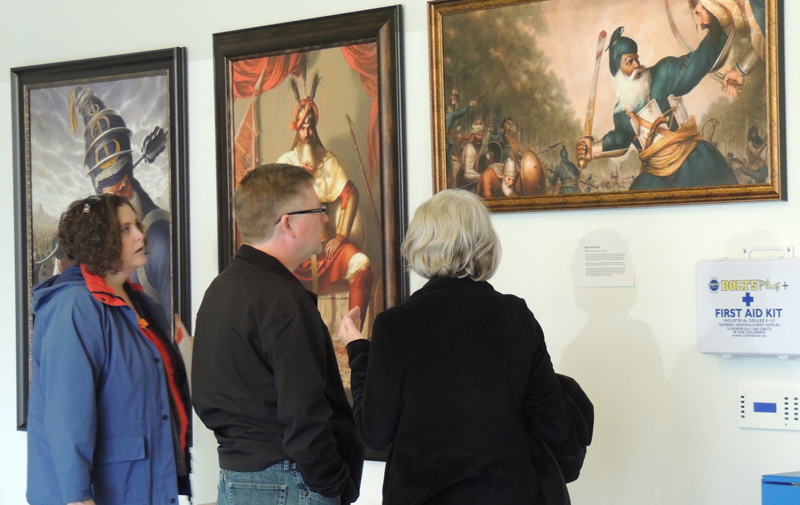 They took time to carefully read about each painting. 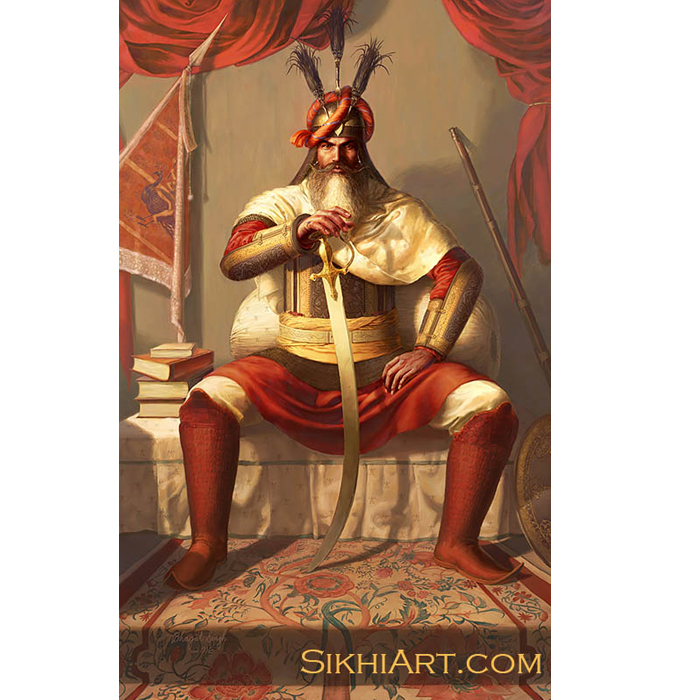 To see a Sikh paint Shiv ji also inspired them to learn about us, about who we are and what we represent. They reciprocated my gesture. In the modern age, everyone including Sikhs have to learn about other faiths, so that they can understand where others are coming from and interact with them on a deeper level. 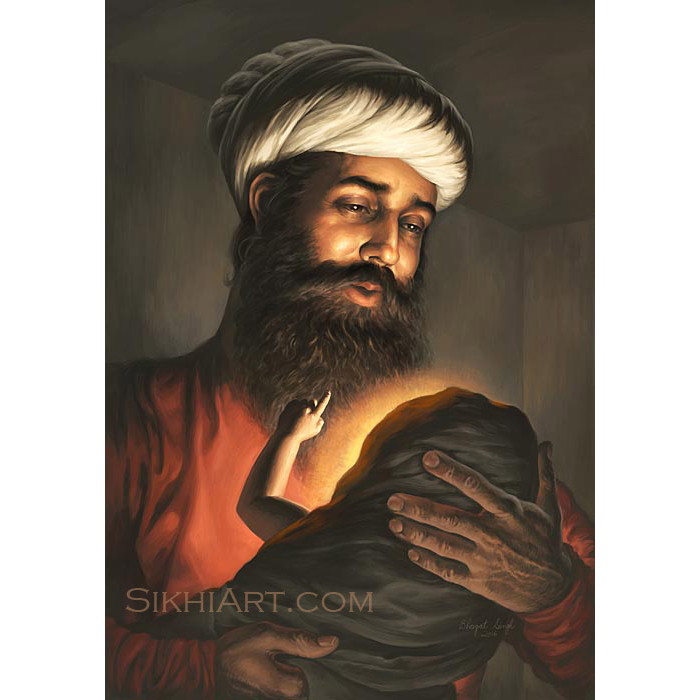 Some Sikhs ask me – Why do you paint things from other religions? The true answer lies in our Ardas. 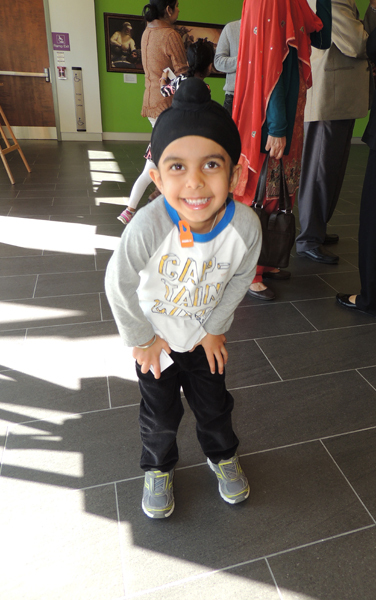 The theme of this Sikh Heritage Month was the “Celebrating the Sarbat”. Sarbat is short of Sarbatra meaning “everywhere”. When in Ardas, we say “Sarbat the bhalla”, we are not just talking about Sikhs, but everyone, including members of all faiths and even the faithless. Therefore an ideal Sikh is not selfish, he does not seek to benefit only his own Sikh community. An ideal Sikh is selfless, and he serves all communities, just like what Bhai Kanhaiya ji did in the Battle of Anandpur, in 1700s. The goal of the ideal Sikh is the well-being of all. He stands up for goodness wherever it exists. I think that is the message behind Sarbat the bhalla, and that’s what I stand for. Nanak naam chardi kala, tere bhaane sarbat da bhalla! 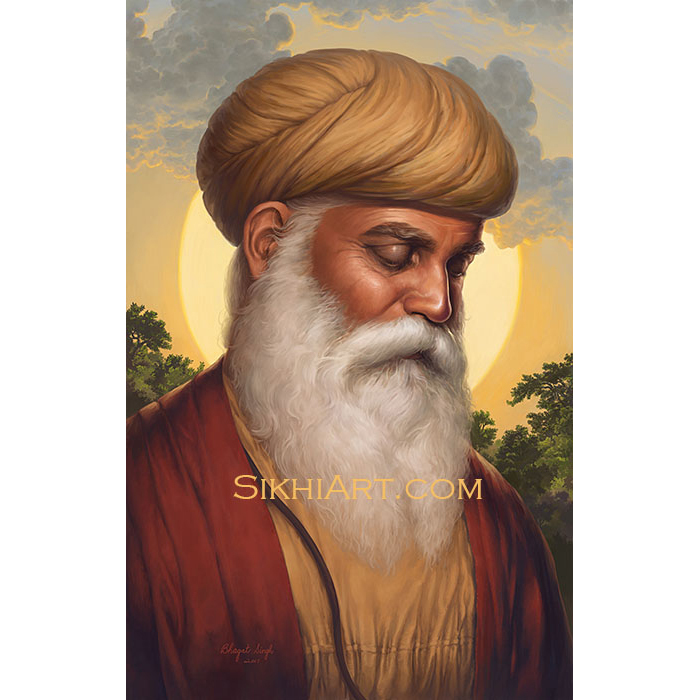 Guru Nanak’s name inspires a rising state of being, and by God’s grace, may everyone everywhere be well! 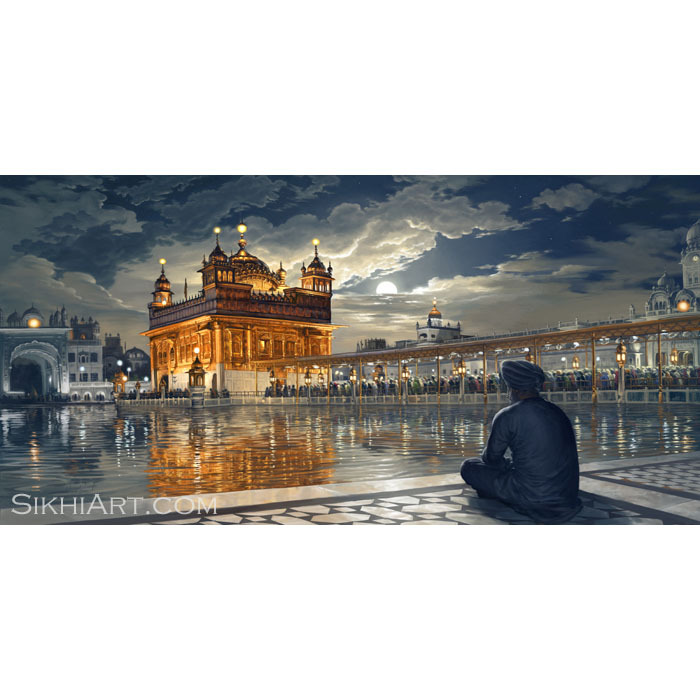 ← Welcome to Sikhi Art! Where do you hold your exhibitions sir? By any chance holding any in Australia?? I really wish to bring my kid to one of these?